September flooding in Pennsylvania (from remnants of Hurricane Irene) spelled disaster for an elderly lady. After having to leave her home, she decided to find a good home for her 13 rabbits. 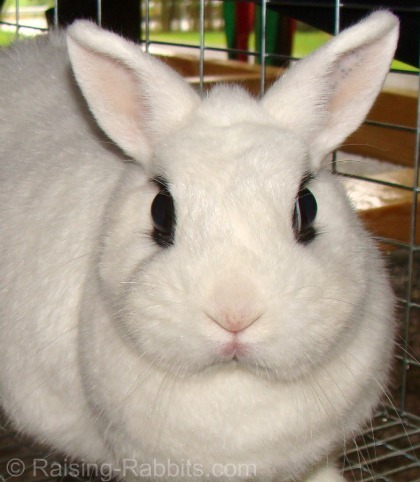 Through a chain of quasi-relatives and acquaintances, the rabbits were offered to Ed, a visitor to Raising-Rabbits.com. Until now, Ed had several mixed-breed rabbits which he bred occasionally, and the local pet store purchased the bunnies. The newly acquired rabbits are pedigreed, in very good condition, and some of them are grand champions. 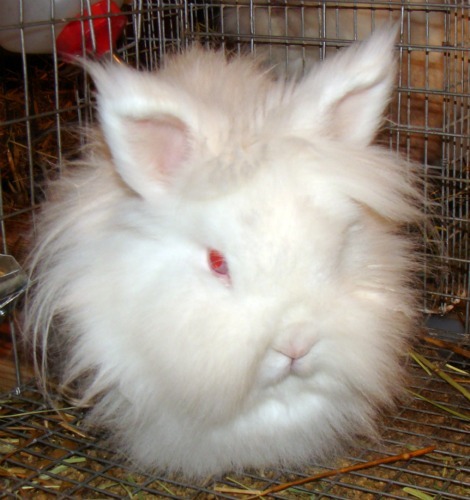 "It appears that I got five different breeds: one Flemish Giant, one Giant Angora, three, I'm not sure what they are, I'm guessing Havana Chocolates, they have short velvety fur, two Dwarf Hotots and the rest are Lionheads. Not sure what the gender of all of them are yet. "So, now the big question is, what to do with them? These are not like my other rabbits where the local pet store gives me $5 each for the bunnies. I guess I need to adjust my game plan a little. "My loving wife thinks I am getting in over my head with all of these rabbits, and maybe she is right, but I keep thinking that God gave me these rabbits for a reason, I just need to figure out what that reason is. As I stated in my website, there seems to be no profit in selling pet rabbits...!" Now Ed is scrambling to build cages for these rabbits. He’s opting for PVC and double-stacked. We feel confident Ed will discover God’s purposes soon enough. 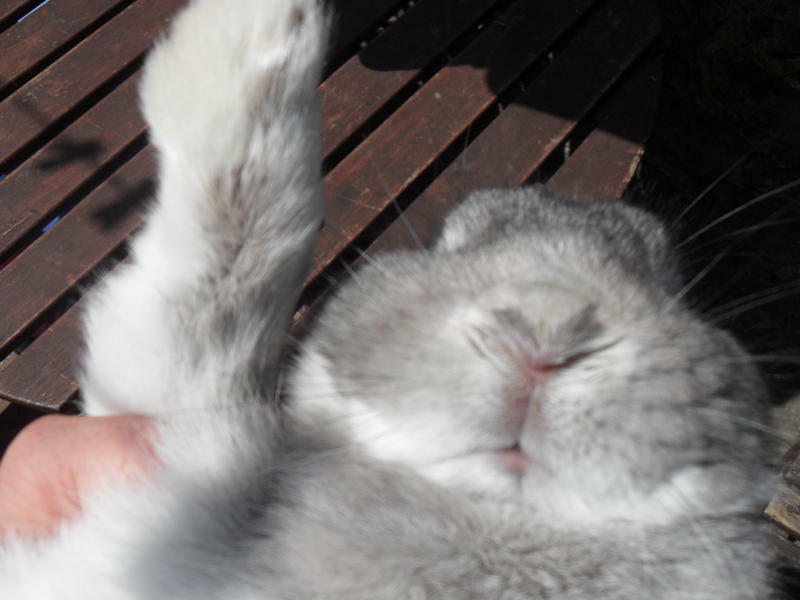 Last month we featured a rabbit with a damp nose and damp mats on his paws. The owner, Angie, sent us an update very recently, confirming to us that after all summer with just a damp nose, the buck began sneezing frank white snot, and Angie euthanized him to protect the rest of her rabbits. "In the vast majority of rabbits, symptoms like these are chronic and unmitigated, with an occasional lull during times of stronger immunity. 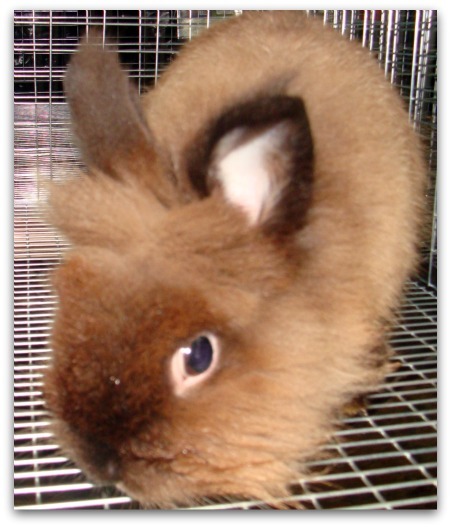 The rabbit is probably infected with both Bordetella and by Pasteurella multocida." "Her buck’s immune system has been strong enough to keep him stable...for now. Fortunately for her and her other rabbits: she isn’t fooling herself. She has kept him in quarantine. One day she knows he’ll take a down-turn, and will require euthanization." Friends, it isn’t just ME that describes pasteurella and bordetella as being incurable. Every animal scientist worth his salt says the same thing. Your own rabbit-savvy vet will admit it. We're sharing Angie's story with you in hopes that you can avoid the heartbreak of getting a pet that turns around and gets incurably sick shortly after you purchase it. Snuffles is not curable, no matter the insistence of some people. It's treatable, yes...in the short term. But like a cancer for which subsequent rounds of chemo are less and less effective, antibiotics remain effective against snuffles only until you’ve created super-germs in the rabbit. You will have doomed any other rabbits that come into contact with the new-and-improved, very buff, pasteurella germs. I know this perspective is not popular, especially with no-kill shelter personnel and in some pet circles. We’re sorry -- it’s just the nature of the bug. It is our longing to help you avoid disappointment. We're not naive enough to think that the germs will ever go away. But rabbit breeders and pet owners are certainly capable of breeding enhanced health and immune resistance into the rabbit population. This occurs when only healthy animals are used for breeding. Invasion of the Grave-Snatching Rabbits! "Rampaging rabbits are ‘waking the dead’ by burrowing into graves and digging up bones at a historic monastery." So starts a Scottish news article about an ancient graveyard being vandalized by rabbits! "Skulls, ribs and teeth have all been unearthed at Kinloss Abbey, near Forres in Moray. The graveyard has been taken over by rabbits that are burrowing into plots dating back to the 1700s. "Stated Mr. David Fox, the church minister: 'It's the stuff of nightmares...You should have dignity in death. You shouldn't be tripping over people's ribs and teeth when you visit a graveyard... It's horrific.'" Turns out the problem isn't actually a new one at this graveyard. The town council has utilized vermin control in the past. Looks like they're due for another round! If their abatement program uses guns and traps as opposed to poison, perhaps the meat might make meals for the local homeless or folks down on their luck. Your friends at Raising-Rabbits.com wish you a wonderful October.